Our gloves provide more than just protection for your skin, they enable you to work safer and more efficiently. Whether you’re a professional painter or an industrial worker, Trimaco has exactly what you need. 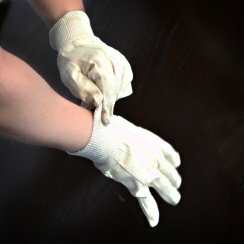 Our comprehensive selection of high-grade gloves includes nitrile, latex, medical and non-slip rubber protective gloves! Like all of our personal protective equipment products, our work gloves offer hand protection from a wide variety of hazards and spills, from solvents and chemicals to paint and epoxy resin. And don’t just protect your hands—make sure to check our our full line of protective clothing products, such as eye glasses for eye protection, respiratory protection from fumes, DuPont Tyvek Coveralls and other occupational safety products. Lightly powdered and economical gloves offer lightweight protection. Soft and durable gloves offer medium weight protection and are more puncture resistant than latex. These lightweight gloves are made of high-quality yellow latex to provide waterproof protection. 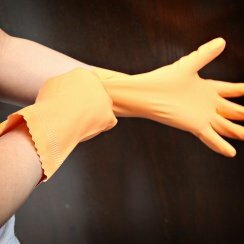 Medium weight gloves are made of flock lined, high-quality orange latex for use during heavy duty refinishing and cleaning jobs. Heavyweight gloves are made of liquid proof, high-quality black latex to be used in industrial applications. Heavy neoprene, black, flock lined gloves are super chemical resistant. 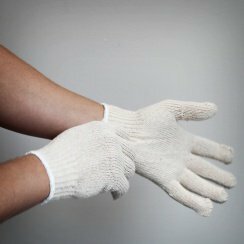 Natural colored cotton gloves with knit wrist are ideal for painting and household chores. Made of cotton knit jersey material. 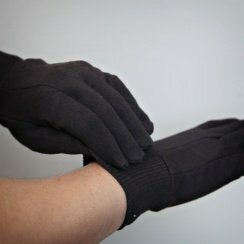 Medium weight string knit gloves offer comfortable, light protection.